What are you thinking about when you choose flowers as a gift for the woman you love? Do you think what the flowers mean? Or maybe what she will do with them? Or do you simply want her to smile every time she looks at the gift bouquet you gave her? In any way, this bright arrangement is a great fit for every purpose. 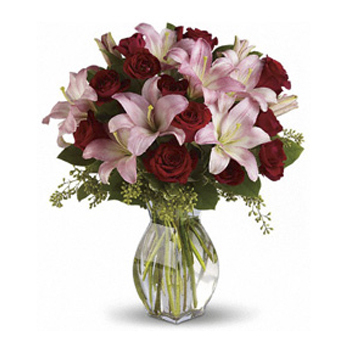 It means love, it will decorate any room in her home, and it will sure make her smile and remember about you when she looks at this bouquet of red roses and pink lilies.